Though many people amass a wardrobe naturally as they grow up, there are simply basics that every woman needs in her wardrobe for modern day living. 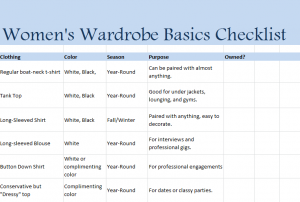 The women’s wardrobe basics checklist is an effective way to stock your closet with the essentials you need all year around. The list covers the recommended color for items, so as you go through the list, be mindful of your own complexion and color preferences. General people choose a wardrobe that is black based or brown based, and prefer light or dark colors. Make sure your basics match in hues, and avoid irregular patterns that are hard to pair with other items. You can cross out seasonal items that may night apply to you, such as boots for snow if you live in a warm climate that doesn’t require them. Likewise, add items if you live in an extreme climate that may require a full snow suit. Some items you’ll want to get multiples of, such as tank tops. This is just a basic list to get you started so you will have something to wear for any situation or occasion. Add to it as you think of items you think you will need for your lifestyle.